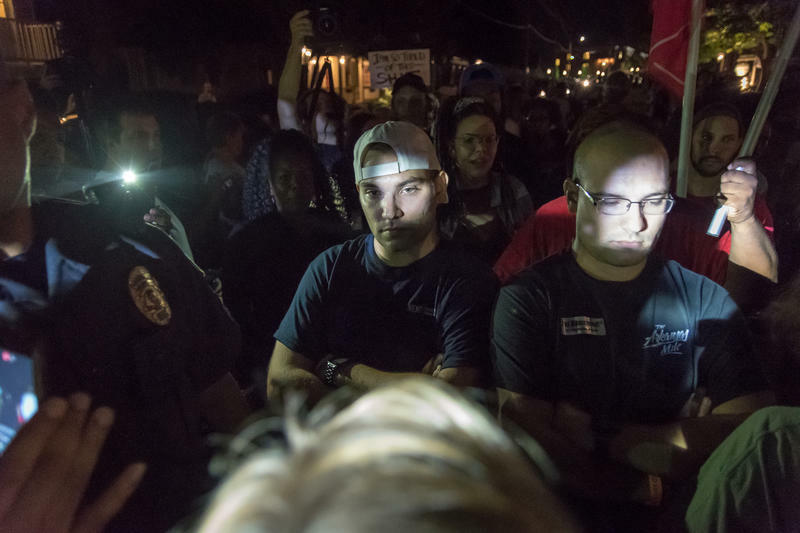 A protester stands in front of a line of St. Louis Police officers on Sept. 15. As the days of demonstrations over Jason Stockley’s acquittal go on, protesters in St. Louis are outlining the policy changes they say will help create a more equitable justice system and police department. The main demands involve giving St. Louis and St. Louis County police additional training, equipment and oversight — things that were proposed after a Ferguson officer shot Michael Brown in 2014 but never enacted. That’s because most bills required changes to state law, and the GOP-controlled General Assembly didn’t go for it. St. Louis police officers do not wear body cameras. The St. Louis Police Officers Association would need to agree to allow officers to wear them on a permanent basis. St. Louis Mayor Lyda Krewson, Comptroller Darlene Green and Board of Aldermen President Lewis Reed agreed last week to a one-year trial to equip all officers with body cameras. They’re also seeking bids to have a company permanently supply the devices. St. Louis Public Radio's Jason Rosenbaum looks at what types of policy changes protesters want after the Jason Stockley verdict. Why people are for it: The devices arguably provide solid evidence of a police officer's actions. Neither Stockley, who shot and killed Anthony Lamar Smith in 2011, nor former Ferguson police officer Darren Wilson were wearing body cameras at the time of those events. Why it may not happen: The St. Louis Police Officers Association would have to agree to officers wearing body cameras; it has traditionally opposed the idea. Even if the police union ultimately reverses course, city leaders will need to figure out a way to pay for the technology, its maintenance and for storing the footage once the free trial ends. St. Louis Circuit Attorney Kim Gardner backs having outside investigators look into situations where a police officer kills someone. Right after the Stockley verdict was announced Sept. 15, St. Louis Circuit Attorney Kim Gardner suggested that another law enforcement agency, such as the Missouri Highway Patrol, should investigate cases where a city police officer kills somebody. “If we want to have a fair and unbiased investigation, we need to address that investigation so that we can pursue justice fairly — regardless of the outcome,” Gardner said. Republican and Democratic lawmakers sponsored bills to bring in an outside prosecutor for police-involved killings. Why people are for it: Gardner questions whether St. Louis’ police department can adequately investigate itself. Proponents of the idea also say elected prosecutors work too closely with police to be objective in cases where officers are suspected of committing a crime. Why it may not happen: Similar efforts went nowhere in the legislature after Brown’s death. Democratic St. Louis County Prosecutor Bob McCulloch, who was in charge of the grand jury that ultimately decided not to indict Wilson, argued last week that it wouldn’t be clear who the special prosecutor would be. 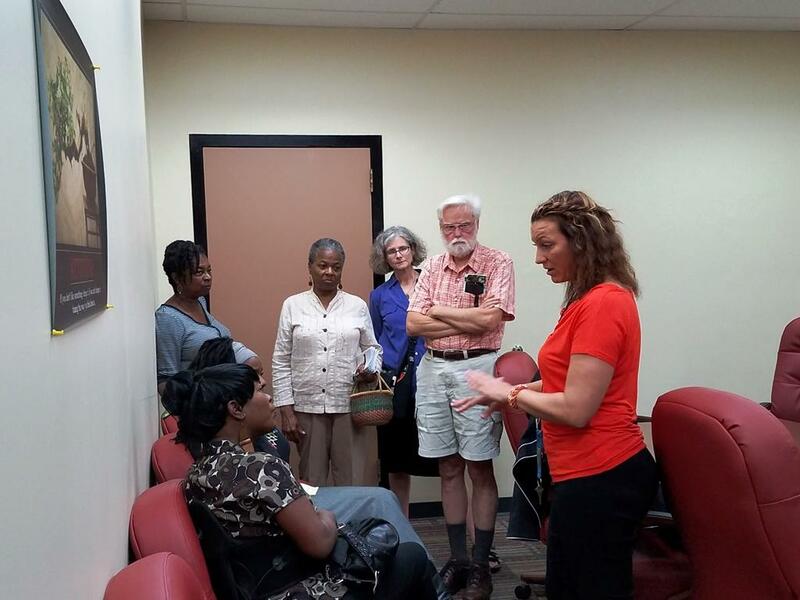 Clara Norise (seated) speaks to Nicolle Barton, the executive director of the Civilian Oversight Board, after the board's meeting on Sept. 19, 2016. The board investigates police misconduct, but doesn't have subpoena power to compel witnesses to come forward. After Brown’s death, St. Louis aldermen created the Citizen Oversight Board to look into allegations of police misconduct. The board doesn’t have the ability to compel police officers to testify. Why people are for it: Alderman Terry Kennedy, D-18th Ward, said the board ultimately would be more effective. “It will give them the ability to compel individuals, and may not be the police, to provide information,” he said. Why it may not happen: Kennedy, who sponsored the bill establishing the board, said St. Louis’ voters likely would have to change the city’s charter to allow for subpoena power. State law may need to be changed as well, Krewson spokesman Koran Addo said. 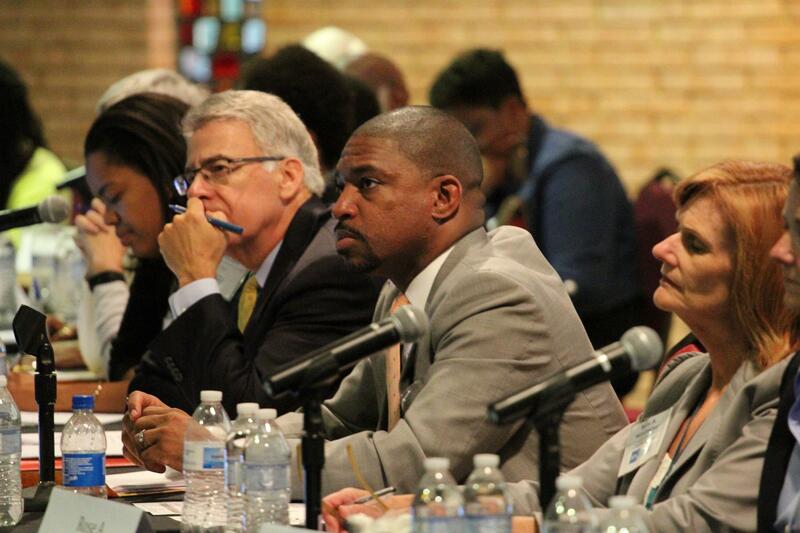 Members of the Ferguson Commission listen to testimony at a 2015 meeting. The gubernatorial-appointed commission released a report of law enforcement, education and public health recommendations in September 2015. The Ferguson Commission report, released in 2015, includes dozens of law enforcement, education and public health recommendations. Some of the police-related ideas include increasing racial sensitivity training for officers, changing rules about when police can use deadly force and creating a database that tracks whenever an officer kills someone. Other suggestions include making it easier for low-income parents to pay for preschool, increasing the minimum wage and expanding public transportation services. Why people are for it: A number of demonstrators, including Stephen Houldsworth, said Thursday that the report is a roadmap for politicians to address the area’s racial disparities. “We had experts working for months and months and months on it. There’s no need to reinvent the wheel, just put that into place,” he said. Why it may not happen: Few of the law enforcement-related ideas have been implemented because lawmakers weren’t on board. That includes things adopted in other states like Illinois, where they established a police misconduct database and expanded the type of training officers need to complete. The 2015 bill was passed in response to Brown’s death, Freddy Gray’s death in Baltimore after riding in a police van and the 2014 fatal shooting of Laquan McDonald by Chicago police. Still, Krewson said last week, the report is “our way forward” after the Stockley verdict. Because she oversees the city’s police department, she could require officers to follow some of the recommendations without assent from state lawmakers or aldermen. Protesters called for St. Louis interim Police Chief Larry O'Toole's resignation on Monday. Among other things, demonstrators are upset at the tactics officers used on Sept. 17 to arrest 80 people in downtown St. Louis. It’s not exactly a policy change, but protesters demanded Monday that O’Toole resign. Since protests began on Sept. 15, demonstrators sharply criticized St. Louis police for their tactics — most notably Sept. 17, when officers arrested 80 people in downtown St. Louis. Why people are for it: O’Toole wasn’t in charge of the police department when Smith was killed. But O’Toole’s departure could allow the police department to make changes from within, even if his replacement is permanent. Why it may not happen: If O’Toole doesn’t voluntarily step down, it would be up to Krewson to act. She may not want another temporary leader when there’s a nationwide search to find a permanent chief. St. Louis Public Radio's Jo Mannies and Durrie Bouscaren contributed to this story.